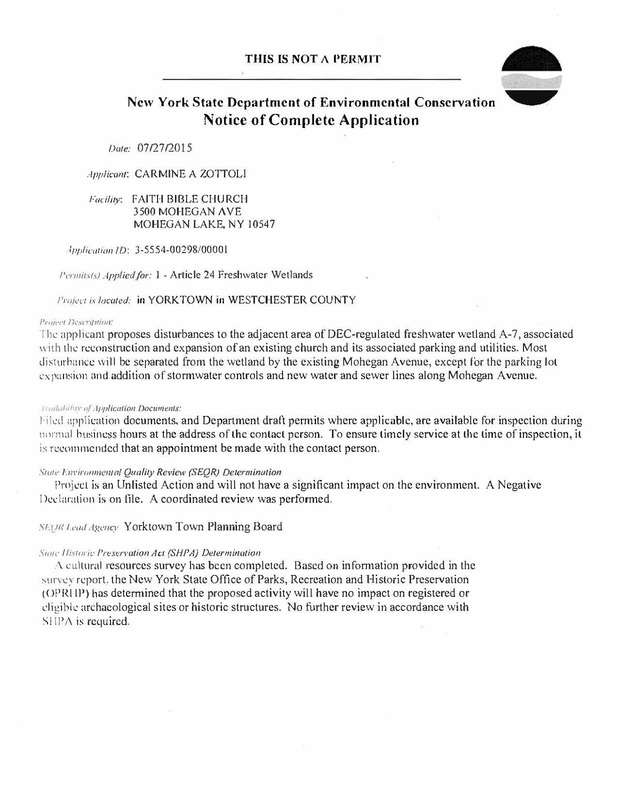 Well, after a solid 4 and one-half years, we finally get to comment on the Department of Environmental Conservation application for Faith Bible Church. 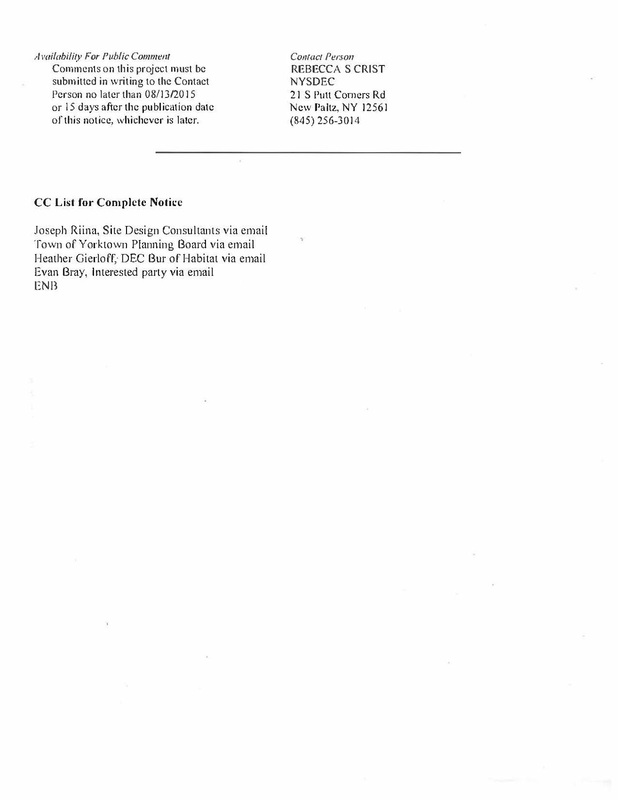 We have 15 days (until 8/13/2015) to supply written comments to the DEC. Below is the official notice. More details on issues we have with the proposal (e.g. running a sewer line through our lake outflow below the water table) and directions on where to aim your pens. In related news, Yorktown and Faith Bible get served two copies of the enormous Record on Appeal and my brief today. The it's filed in Appellate Court with affidavits of service by Friday. Pretending to be an attorney sure is hard work. More details on the brief and next steps after service. Why the court needs 9 copies is beyond me. We don't get much ink in the New York Times in this neck of the woods. Not the most uplifting story, but local nonetheless. Mohegan Lake Is So, So Swimmable Right Now You Guys! LoHud has picked up the story on our [Mohegan Lake] copper sulfate applications. Lake Carmel Town Supervisor Maureen Fleming says they are going to apply copper sulfate but that's only a "temporary solution," which is true. However, they definitely won't be applying any copper sulfate to Lake Carmel this year. 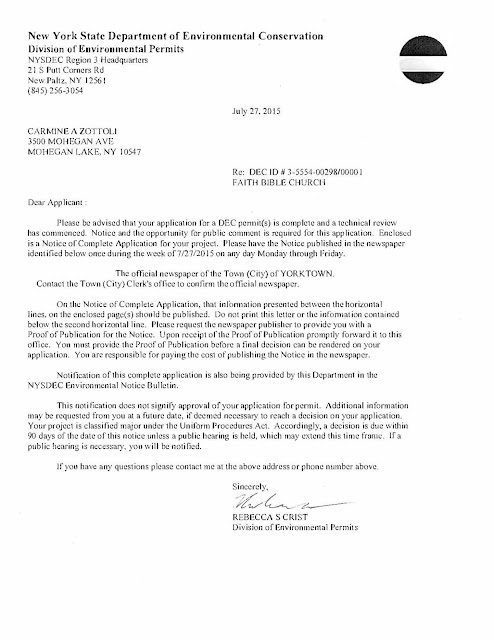 We worked for a good 9 months to get the DEC permit to apply it. While it's only a temporary solution, it works--really well. We are aiming for an aluminum sulfate permit which is slightly longer term at 3 to five years. Still a temporary solution. Hat tip to LoHud for the photo. 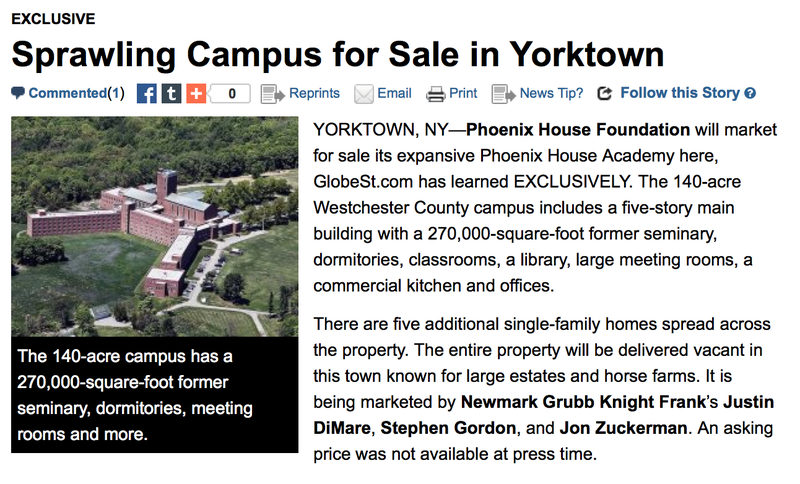 Mohegan Lake needs Yorktown to step up and sewer the houses around the lake that aren't already, at a minimum, to have any significant impact to the long-term health of the lake. 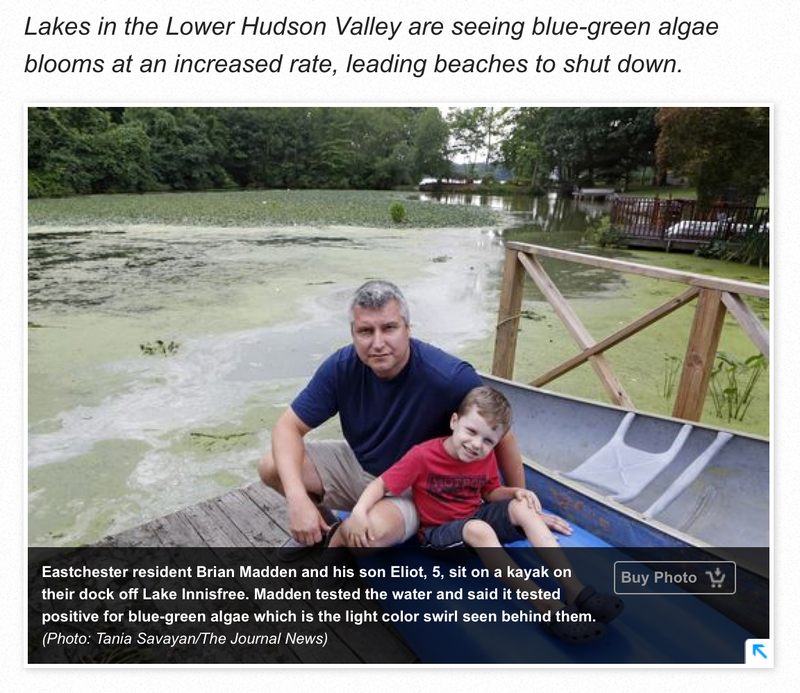 Blue-green algae is a real problem all over New York State and I hope we can all join together and find a real long-term solution. 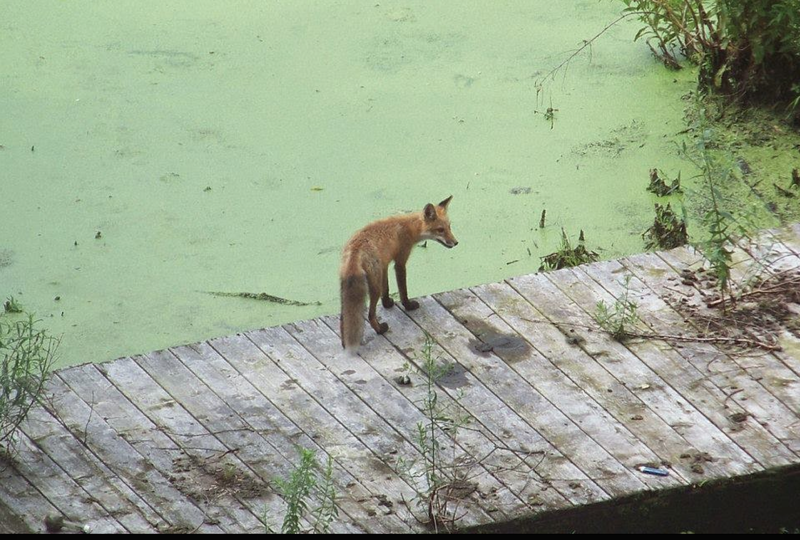 Hey, look at this photo of a foxy fox in front of our bloom last year. Will put up an after picture, but suffice it to say, we have no algae there this year! Copper sulfate! Hook it to my vein! 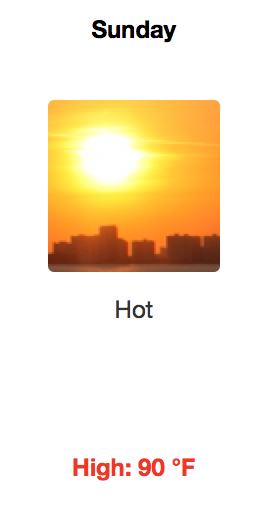 UPDATE: THE TOWN BOARD MOVED THE MEETING TO TOWN HALL BECAUSE OF "HEAT AND HUMIDITY" (BECAUSE IT NEVER GETS HOT AT TOWN HALL?) WHICH SEEMS PRETTY LAME. OBVIOUSLY THEY ARE NOT FAMILIAR WITH THE AMPLE SHADE AND LAKE BREEZE THAT KEEPS US COOL UP HERE. Just got a reminder that the Yorktown Town Board will be meeting from the Mohegan Lake Improvement District (MLID) about tomorrow's meeting. It should be great weather and our lake is looking great after the Town Board was so helpful expediting our wetlands permit required for the copper sulfate applications that have tamped down the blue-green algae. We should definitely give them a big thanks for their help. As MLID's email makes clear, there is an important agenda item about a developer's proposal for a new house mostly within the 150' wetland buffer at 3211 Lakeshore Drive. It's important to note that the Zoning Board of Appeals recently approved a variance a few years ago. That approval languished and then the developer asked for a bigger variance in the form of the footprint of the building. Considering all of the density and congestion (P.S. Mohegan Lake Motors is still storing motor vehicles at the pizzeria) we currently have, it's important to make it clear that we care about our community. The ZBA variance plus building in the wetland buffer of our struggling lake so someone can make a quick buck? There are many other Mohegan Lake issues to discuss. If you have something you'd like to address the Town Board with (e.g. crumbling retaining wall on Mohegan ave. that will end up being the next Baptist Church Road shutdown in a few years, if not sooner), you should stop by. Even if you don't want to speak, you should come enjoy the sunset on our most beauteous lake. Unless weather changes the venue back to Town Hall, the Yorktown Town Board meeting is scheduled for 6 PM Tuesday July 21st at the Mohegan Colony Beach off Oak and High Streets. Come out if you can to show we are a concerned, involved community. Of special interest is a public hearing to build a home on 3211 Lakeshore Drive. Because the lot is on the lake, the seller needs to obtain a wetlands permit from the Town so that the developer interested in purchasing the lot can legally build on it. Obviously, this affects the value of the lot, which is .4 acres, and I believe has access to sewers. There appear to be existing houses to the left and to the right of this lot. Much of the lot falls in the Mohegan Lake 150' wetlands buffer. In order to build, the Town Board must consent by issuing a wetlands permit - hence the public hearing. This represents a unique opportunity for the Town Board to hear from the community living around, or with rights to, Mohegan Lake. This is also a reminder that there will be a treatment of copper sulfate the morning of Tuesday July 21st, so there will be no swimming permitted for 24 hours thereafter. The next copper sulfate treatment is scheduled for Tuesday July 21st. As usual, there will be no swimming for 24 hours after the treatment. The County Health Department tested the lake on Thursday, and notified me that the beaches are ok to stay open. This is the first time in three years that we have been open to swimming in mid-July. Although we originally planned treatments every three weeks through the summer, our DEC permit allows treatments every two weeks. It is the unanimous opinion of the MLID board that we should continue on two week intervals throughout the summer. This will give us our best chance of staying open for swimming through Labor Day. Allied Biological, who is doing the copper sulfate applications, is also taking water samples. A comparison of the sample taken before the first treatment and last week's sample shows that we still have lots of algae growing in the lake, but we have switched from having the water dominated by blue green algae to having healthier green algae species more dominant than the blue green. That's a very positive indication that the copper sulfate application is doing what we want it to do, and is being applied in a small enough dose to minimize the impact on other living organisms in the lake. Below is a message from MLID president Ken Belfer. MHPOA plans to storm this meeting by boat--landing on the beach just before the 6pm start time. 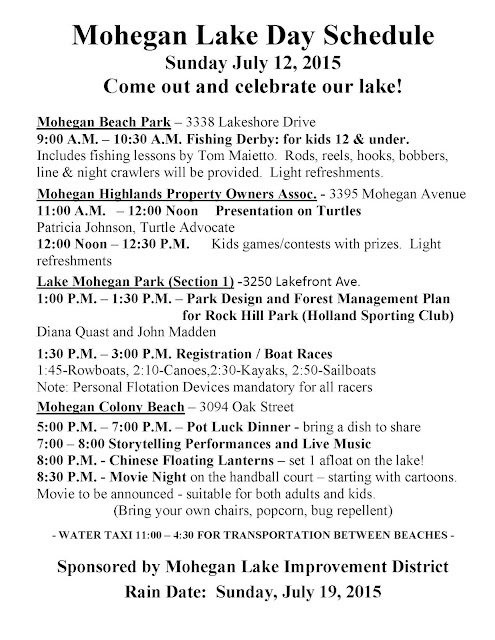 There's a lot to talk about Mohegan Lake and this is a great opportunity to have you're voice heard. Sewers, the new house proposed within the wetland buffer for a developer looking to make a quick buck, infrastructure (Mohegan Ave's retaining wall is about to collapse), health of the lake (we owe the Town Board a thank you for helping to expedite the DEC wetlands permit for our copper sulfate applications which have been very successful), etc... Hope to see you there. If you don't know what that is, it's got the campanile-type tower (plus much more structure) on top of the ridge overlooking Mohegan Lake and the Taconic State Parkway; you've seen it. It was, effectively a juvenile detention center. It's huge and on the market and being marketed by Newmark Gubb Knight Frank, a reputable firm. I'm not going to speculate what goes in there, but there's a lot of possibilities. Let's just say, I'm glad I don't live on Stony Street. Juvenile delinquents locked up don't drive cars, unless they bust out and steal one. That's a very narrow road and with the square footage available, the occupant load could be enormous. The 140-acre Westchester County campus includes a five-story main building with a 270,000-square-foot former seminary, dormitories, classrooms, a library, large meeting rooms, a commercial kitchen and offices. MLID is meeting at the Mohegan Colony Pavilion/Calvary Church at 99 Baron deHirsch Road this Thursday. We are finalizing Lake Day plans and will discuss our copper sulfate treatments. Also, mark your calendars for July 21st. The Town Board is moving their circus to the Mohegan Colony beach. 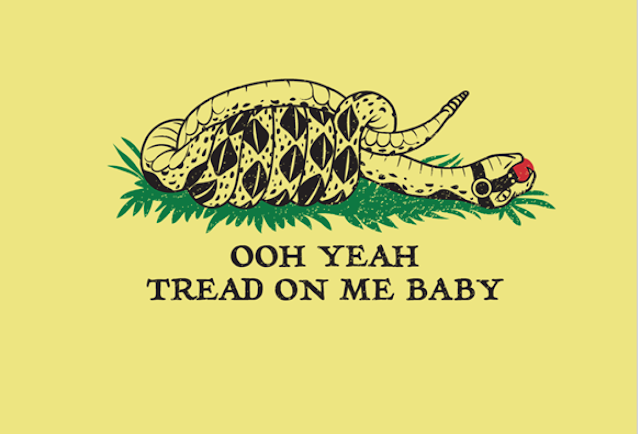 At least come out for the courtesy of the floor (read: airing of grievances). You'll want to keep a tight three minutes on any topic you want to bring up. Of Copper Sulfate, to be exact. Stay out of the water for at least 24 hours; assume it's done by the afternoon. If signs are still up, don't swim. Please enjoy its algae killing effects thereafter!